It’s December! How the time has flown this year! It’s officially okay to put up your Christmas tree everyone! I am going to be that annoying person this year who hums Christmas songs all day long at work and at home. I will play Christmas carols on loop via the playlist. Yup! Can you tell I am excited that the silly season is here? 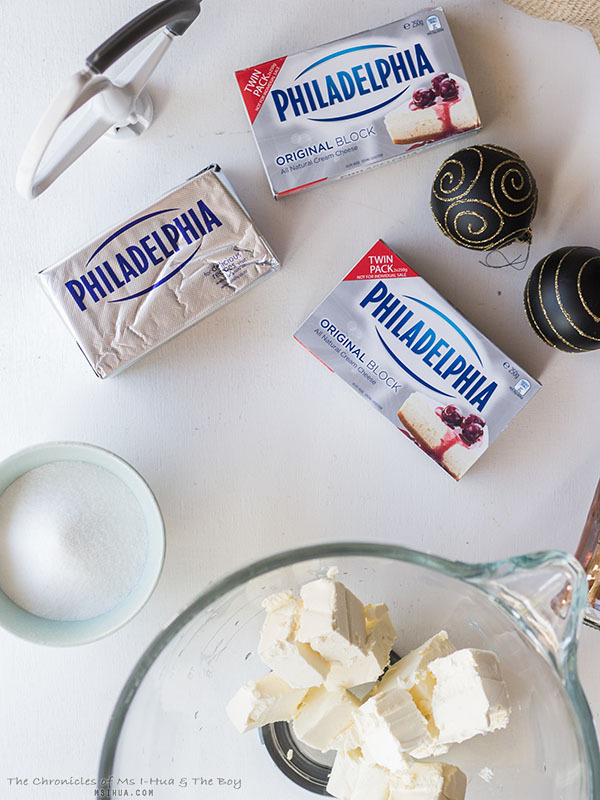 I love cooking with PHILLY cream cheese, but have never attempted a cheesecake before! How silly is that? I have always been too afraid to make a cake out of cheese. With PHILLY cream cheese, I didn’t have to worry at all about the quality of the cheese, I just had to come up with a recipe that would make mum proud! 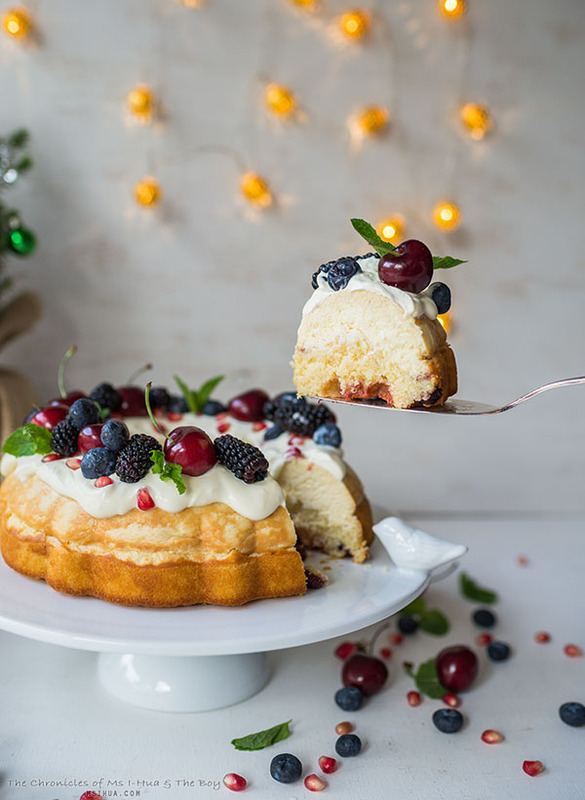 This year, I have also been busy in the kitchen with PHILLY cream cheese, creating an amazing cheesecake that will not only make your Christmas more spectacular, it will shut down the noise around the Christmas dinner table for the duration of when this cake is served. Trust me, I’ve already made two of these and my office was unnaturally quiet as everyone was too busy eating cake. 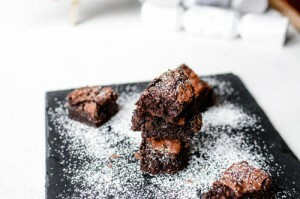 I’ve had all sorts of feedback received for this recipe. Ranging from, “Best damn Cheesecake ever!” to “This taste like Christmas!”, to “You are the Cheesecake Master!”. So as you can see, I am pretty well chuffed about it. 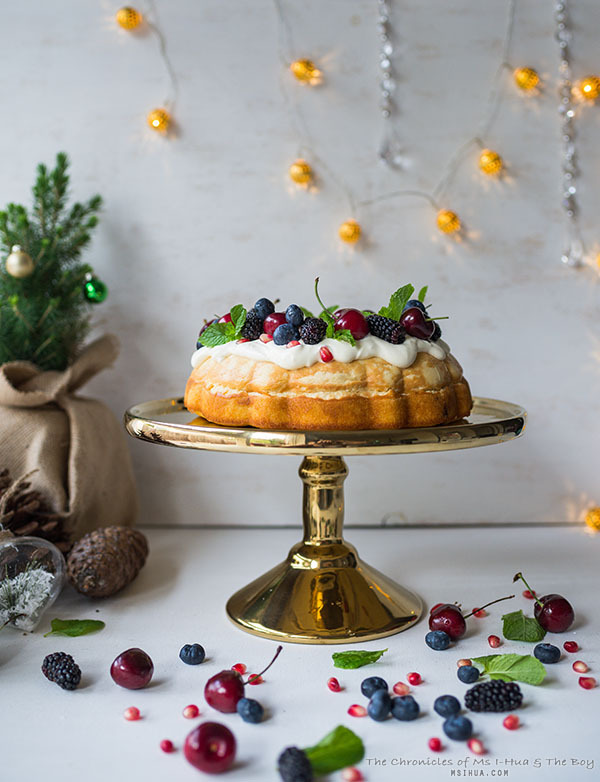 I wanted to incorporate what I believe Christmas to be (booze, happiness and bright colours) in the form of a cheesecake, into a show-stopping centrepiece. To be honest, the first time I attempted this, I had a spectacular cake fail, with the cake breaking into two sections as I impatiently turned it out of the bundt pan whilst it was still slightly warm. Still, it tasted good and the feedback from colleagues was that it was the best cheesecake they had ever had! The second time I made this cake, I gave it all my love, care and patience. I also improved on the recipe for the cake base and went with instinct. This cake is quite a tough one to bake. It’s technically challenging as it has two completely different types of cakes, melded into one. 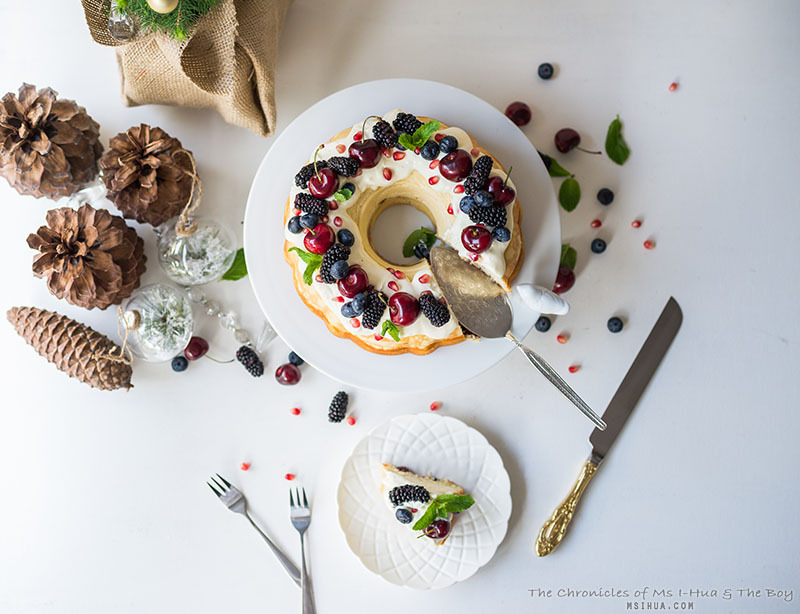 The added complexity with this recipe is that I wanted to make a Christmas wreath with it. Every cheesecake recipe I have encountered has the cheese sitting nicely in a springform pan on its own or on a crumb base. My idea of using the bundt pan, meant that the cheesecake component would sit at the base (when baking) of the bundt pan, so that when you flip it out, the cheesecake component is right at the top. The next part had me deciding how I wanted it served when I eventually turned it out. I needed it to rest on a base. Which is how I came about making a two prong cake, with a Cranberry Rum Butter Cake acting as the base of the wreath. Spray a large bundt pan (I used a 30 inch bundt pan) with vegetable oil. Make sure to wipe the bundt pan with kitchen paper so your cake doesn't end up too oily. Set the oven to 160 degrees Celsius (non-fan forced). In a stand mixer, beat the PHILLY cheese cubes on low speed. Add in the caster sugar and beat until smooth. Continue beating and add in the rum, salt and vanilla bean paste. Pour mixture into prepared bundt pan. Set aside, whilst you prepare the next stage. 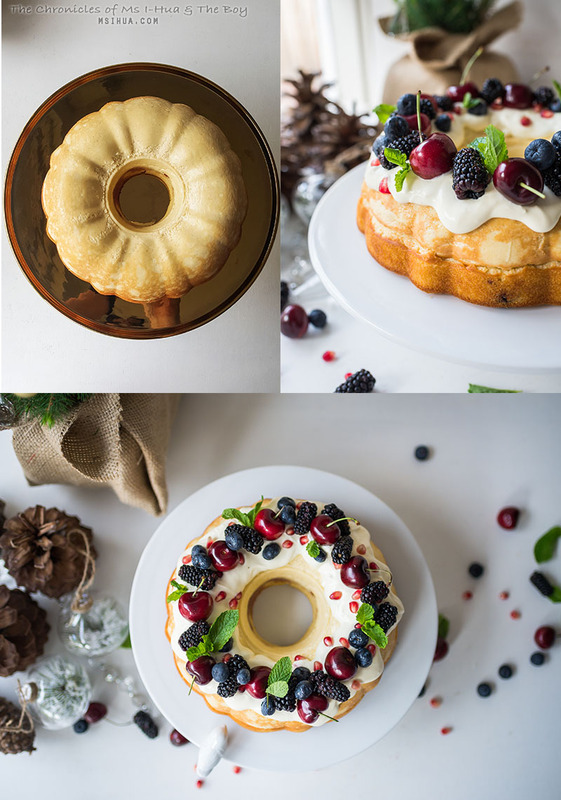 Once you are ready, pop the bundt pan into the oven and bake the cheesecake for 25-30 minutes. In a large bowl, sieve in flour, baking powder and almond meal. Set aside. In a stand mixer, beat the sugar and butter together until smooth. Add in the flour mixture in batches, whilst mixing. The texture of the mixture should be quite thick. Loosen the mixture by adding in the milk. Mix until smooth. Don't worry if there are chunks of butter within the mixture (it'll melt in the oven anyway). Once the 30 minutes is up (from baking the cheesecake), quickly remove the cheesecake from the oven. Speed is crucial here, as cheesecakes tend to not like being exposed too much (with the oven door being opened whilst baking). The cheesecake should be nearly baked by now, and will have a solid form. 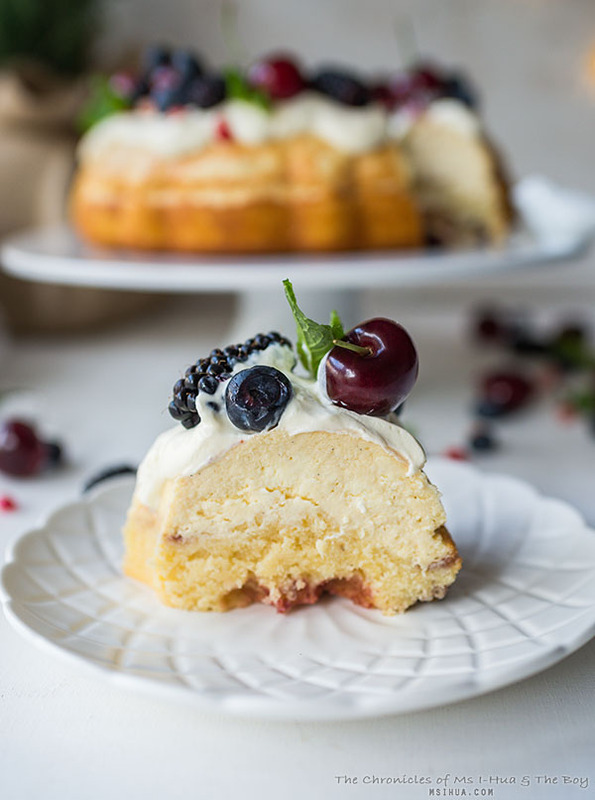 Pour in the Cranberry Rum Butter Cake mixture over the top of the cheesecake, spreading the mixture evenly across the cheesecake. Bake for 30-35 minutes on 175 degrees Celsius (check with a wooden skewer at the 30 minute mark). Once cooked, remove from oven and set aside to cool (1-3 hours). I let mine cool for a few hours before refrigerating overnight for the flavours to develop. Here comes the tricky part. 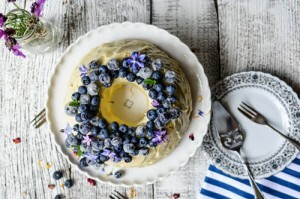 When you are ready to unmould and serve the cake, remove the cake from the fridge and let rest on a benchtop until it comes down to room temperature. When I was unmoulding my cake, the top of the bundt pan where the cheesecake section sat, was still quite cold, so I let it rest on some warm water to loosen up.Using a palette knife, edge along the sides of the bundt pan to ensure that the rest of the cake loosens away from the bundt pan. Turn your bundt pan over onto a cake stand or a serving plate (I tend to place the plate over the pan and turn it all over together). Give it a minute, the cake should loosen enough to drop freely onto the cake stand. To serve, whisk the sour cream together with the caster sugar. Spoon generous amounts over the top of the cake. 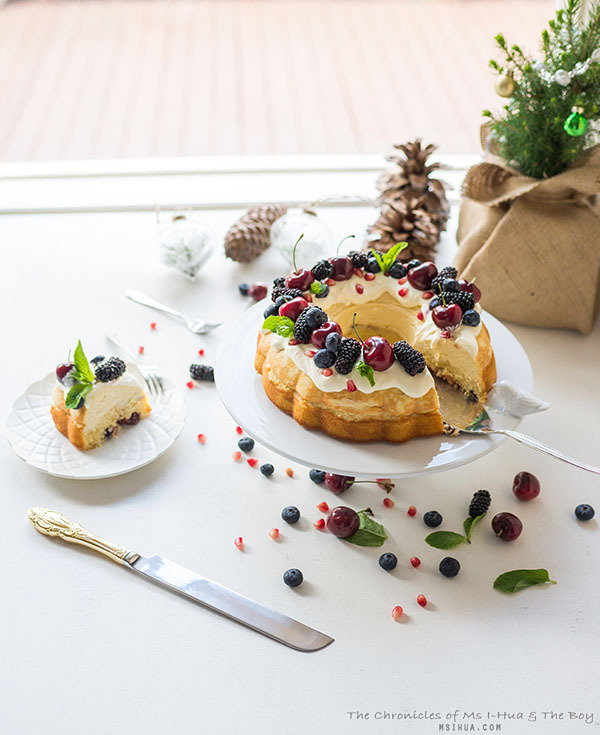 Top up with any summer berries (in the Southern Hemisphere) or any other fruit you can get your hands on to form a wreath. Garnish with fresh mint or holly if available. Notes: *each block comes in a 250 gram pack (so get the twin block). ** the reason why the rum soaked cranberries aren't incorporated into the batter is to prevent the red colour from running and staining the cake. As you congratulate yourself for doing such a good job, serve the cake with tea, coffee or a shot of rum to your brethren and await joyful praise. It’s a cake that requires a little bit more work, patience and care than the usual ones I have created. But it has been well worth it. Not just because everyone loved it so much. It was also quite an achievement for me to have come up with such a technical recipe for myself. So what are you waiting for? Roll up your sleeves, and start baking! When you say 30 inch pan do you mean 30 cm? I can’t find a 30 inch pan anywhere!